15-Jul-2007 -- First let me explain why I consider this confluence as an extraordinary point: It is located directly at the ridge of the highest mountain ranges in the area. It is quite a coincidence that it is right at the top at 2915 m altitude. Although it is the nearest confluence from my home in Zurich, (the biggest city in Switzerland) it is extremely difficult to reach it. The beeline distance from Zurich is 60 km. Draw a circle around Zurich and you find that this confluence is the highest point within that circle. I had been waiting for an opportunity to visit the confluence for a long time, but many conditions apply for a visit: it should be summer due to the snow conditions on the glacier, the weather should be appropriate and as an employee I am restricted for weekends. Finally I had to find somebody to join me, since crossing a glacier alone is too risky. Saturday morning Hans-Jakob (a colleague from college) and I took a train from Zurich to Luchsingen from which you get a great view of the confluence mountain. Luchsingen is a village in the Linth valley south-east of the confluence. It is my no means the best starting point for the confluence, but we decided to start there in order to use the easy route through the Klöntal for the descend. This way we didn’t have to take a route twice. We took an alpine route over the Zeinenfurggel pass (2435 m), which involved difficult climbing. Then we descended into the Zeinentäli. It was getting late, so we tried to find a shortcut to the Glärnisch Hut, our destination for the day. May be it was shorter, but we had difficult climbs in-between that delayed us even more. Reaching the hut late and exhausted, we slept like stones. On confluence day, we got up at 5:30 am and started hiking one hour later. The Glärnisch Hut is at 1990 m elevation at a beeline distance of 2.8 km from the confluence. Being early is a good idea, because there are still 1000 m in height to ascend. The day was extremely warm. Even in the morning we simply wore T-shirts. There is only one possibility to access the confluence: starting from the Glärnisch Hut, ascending further over the Glärnisch Firn – this is a glacier starting at 2350 m elevation. The glacier needs to be crossed. In order to make a successful traverse it is essential to ask for the conditions of the glacier and the equipment to bring. In our case the glacier was still snow covered so crevasses could not be seen. This top layer consisted of fresh snow that prevented us to walk over the slippery glacier ice. At 2700 m altitude and a distance of 700 m from the CP (shortly before reaching the ‘Schwander Grad’ ridge), we left the main hiking route in order to attempt the confluence. Now we found our own track through the deep snow. The closer we came to the confluence, the steeper got the terrain. As the grade got extremely steep, Hans-Jakob found a further approach too dodgy. We decided that I would attempt it alone while he waited for me. After leaving the glacier a very steep rock face was ahead of me. The main problem of climbing was that most of the stones are loose, so one can not be sure if the grips are safe. Nevertheless I made it over the ridge on the southern side, which gave me a great view to the confluence. Soon I run out of my natural adrenalin and I got frightened about what I was doing. A look at the display of the GPS confirmed that I was only 90 m from the confluence, so I decided to take the pictures and return. Climbing down was even more dangerous and took me quite a while. After joining with my friend we commonly went towards the Vrenelisgärtli mountain. The views were spectacular; all of Eastern Switzerland’s peaks could be seen. On our descend we found a route that could be an easier reach for the confluence: crossing the glacier further down towards the Bächihorn mountain and then follow along the ridge towards the confluence. But Hans-Jakob was not up for it and anyway a 2000 m descend was still ahead of us, so we skipped that. We descended the normal route via Glärnisch Hut, Wärben, Chäseren into the Klöntal. In Vorauen we really enjoyed drinking a Panasch (a local beer and soft drink mix). Then we took the next bus to Glarus train station. Time at the CP: 9:12 a.m.
Topography: on top of the Glärnisch ridge. Extreme ‘alpine’ location. Description of the CP: North-Eastern confluence in Switzerland. 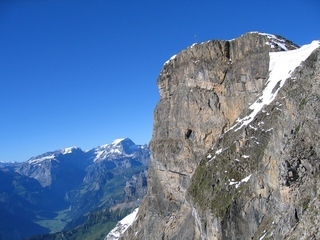 At 2915 m altitude on the ridge with steep rock faces in almost all directions. 360° views of Swiss mountains and lakes in the valleys. Spectacular point!!! Coordinator's Note: This point is dangerous and future visitors would be advised to take professional advice or use a local guide. This is the second highest Confluence in Europe (extending unto the Ural Mountains, von Strahlenberg definition) (Source: SRTM 90m digital elevation data).